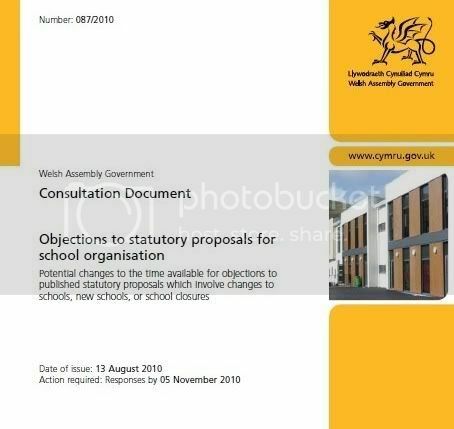 It was either great timing or an even greater stroke of luck that Leighton Andrews' should announce the consultation on revising the statutory procedures for schools reorganization at the same time as news broke that Ysgol Capel Iwan would have to remain open for up to a year, even though it has no pupils. It's all to easy to put two and two together and conclude that we must speed things up in order to prevent future fiascos of this sort. But I think we'd be shooting at the wrong target. The situation at Capel Iwan is a fiasco, but it is not too serious a fiasco. It's easy to throw a figure like £110,000 into the air, but the reality is that the staff concerned are not going to be paid to do nothing; they will be given notice or deployed elsewhere. And even if the school had been formally shut down, the building would still be there; empty, needing security, and as likely or unlikely to find a new use as it is now. Yes, it is an embarrassment to Sir Gâr, who had not addressed the problem of a school where the numbers had halved from around 30 in 2006/7 and 2007/8 to 16 in 2008/9 and 13 in 2009/10. But the irony is that if the Council had made a proposal to close the school, it might well have galvanized the local community into a protest campaign and action to save it. That might have encouraged new parents to send their children there, and that might have kept it going for longer. Perhaps lack of publicity allowed this school to die a "natural death". School closures of this type are inevitable. By any objective measure the number of surplus spaces in schools has to be addressed, and this means that some schools will have to close. In a good number of cases, given the demographic trends, the situation is so black-and-white that it is tempting to think that the statutory procedures can be made more simple. But we must be very wary of using these black-and-white cases as a justification for curtailing all statutory procedures. The tail must not be allowed to wag the dog. The consultation document that Leighton Andrews has produced is very simple. It merely proposes that the statutory objection and response periods be halved, and that they must not be made in school holidays. In my opinion this is far too simplistic a "solution" to a rather more complicated problem. The main principle at stake is that people must have adequate time to consider and respond to reorganization proposals. It seems obvious to me that reducing the objection period from two months to one month is, in some cases, not going to allow enough time for this to happen properly. Firstly the documentation is not always available at the start of the period, and secondly it still doesn't give enough time for the local community to set up meetings to discuss the proposals. We need to be aware that there might be two very different scenarios under which changes are proposed. In all cases the local authority will have already put proposals out for preliminary consultation, in many cases with a number of different options in a genuine desire to engage with the community to find a way forward. In such cases I believe that the statutory process could be refined, because the resulting formal proposal will hardly be news to the community concerned. However, there is another scenario in which a local authority could come up with a markedly different proposal, perhaps because of the unacceptability of a first proposal that did not properly consider the range of options. So although cutting the statutory period might well be reasonable in the first case, it would not be reasonable in the second. The better solution must surely be for the statutory period to be cut only when there has been sufficient previous consultation on a number of options beforehand, and where the chosen proposal is substantially similar to one of the options. This will mean giving the earlier consultation some statutory status. Publishing it with this status would be necessary to prevent a very cursory proposal being passed off as a proper consultation. When it comes to a local authority's response time, I would have no objection to this being cut from a month to two weeks. In most instances it is a foregone conclusion that there will be at least one objection to any proposal, and only one objection is all that is currently necessary before the decision is referred to the Welsh Government. So the local authority becomes not much more than a "sorting office". There's no issue of principle at stake, just paperwork. But Leighton Andrews' proposal misses the wider point. The bigger problem that needs to be addressed is that it only takes one objection for the matter to be referred to the Welsh Government. To my mind, this is a ridiculously low threshold that we urgently need to revise. I realize that there is a political "power play" in operation here. This proposal has come from the WG, and the changes it proposes will simply put more pressure on local authorities without imposing any commensurate improvement in response at a national level. Leighton Andrews has also made no secret of the fact that he wants to take education out of the hands of the 22 local authorities and put it into the hands of a smaller number of regional education authorities instead. In this "power play" it is hardly surprising that his proposal makes no attempt to change the unequal balance of power between local and national government. It is also worth pointing out that if such regional education authorities are formed, they would need to have a corresponding degree of democratic accountability. Local authorities have the great virtue of being directly elected. I believe that we should set higher thresholds for the number of objections necessary before a decision is passed to national government. I think we also need to make a distinction between objections from local people and organizations, and those of others from outside. I wouldn't want to be dogmatic about the figure, but it has struck me as odd that some proposals attract many thousands of objections when the numbers who would be affected by the proposal can only be in the hundreds. I'd suggest that it should take a minimum of 25% of those in the catchment areas (i.e. the immediate catchment area and the surrounding catchments which children would move into or from) and for the number of such objections to be greater than the number of endorsements, before the matter can be referred to national government. Of course that wouldn't stop others from outside the area making objections or endorsements, or having them considered in the same way as local objections. But I have a degree of misapprehension about even that. For in principle I think that these decisions should be made locally rather than nationally. Perhaps a good analogy would be with the planning process: that the decision would normally be made locally, but that the minister concerned would be able to "call in" certain proposals in certain defined circumstances. I think that the role of national government should be to set targets and lay down procedures to be followed ... and in addition to this they will also exercise a large degree of influence by means of funding. These tools should be quite sufficient in themselves without passing the power to make almost every decision to a minister in the WG. There is one other aspect in which the current decision-making process is fundamentally flawed. In some cases the decision will either be to do what is proposed, or not to do it. But in other cases there will be a number of different options, each of which will have its pros and cons, but with not much to choose between them. What happens at present is that a local authority will, if it conducts a preliminary consultation, have put a number of options forward for consideration. But it will then only be able to put forward one statutory proposal ... though hopefully the one chosen will reflect local opinion better than the others. If the proposal is referred to the Welsh Government (no matter whether we establish a new threshold or not, or whether the proposal is "called in" under the alternative arrangement) the minister is currently only able to rule on that one proposal. S/he must either accept or reject it, and if s/he rejects it everything has to start over from square one, even though it might be obvious that a solution needs to be found urgently. I would like to see a situation in which the local authority presents a range of options in the first consultation. The LA would then choose its favoured proposal for the second consultation, but could include alternatives. If the threshold for objections was not reached, the LA would proceed with its favoured proposal. But if it was reached, the minister would then have the option of either approving it, or rejecting it in favour of one of the alternative proposals, or rejecting all of the proposals. If Leighton Andrews really is concerned about speeding up the current statutory processes, this flexibility would do much more to achieve that aim than merely cutting out a few weeks, but not changing the current arrangements in any other way. To put it in blunter terms, there is often more than one way to skin a cat. We have until 5 November to respond. Details of how to do so are here. why is education in the hands of local authorities at all. I have to say I have very little faith in them. Local councillors feel obliged to fight to keep all local schools open. They then hope that enough councillors will vote to close it but for them to oppose as the local councillor. It leads to lack of strategic thinking. Despite the petty politics in Cardiff West - Rhodri Morgan telling Leighton Andrews he couldn't close Landsdown for fear of losing the seat, Andrews passing the buck to Carwyn Jones etc. Education in national hands at least gives some strategy and coherence to education. Either make local council wards bigger and so mitigate against the adverse effect of micro managing every school, or place it in the hands of the Assembly govt. There's only 3m people in Wales - as a country we're smaller than many cities and even counties! You might just as well ask why we have local government for anything, Anon. I think local government is essential because different areas have different priorities, and rightly so. I think that national government can and should set standards, but that each area should have a fair degree of leeway about how to implement things in their way, answerable to the people who elected them. There's nothing wrong with a healthy democratic tension between the two. Now I might well agree that Wales has too many local authorities for a population of 3m. But I think there is a big danger that by setting up larger authorities for education without changing anything else, we will lose any sort of local accountability. It will then fall prey to national targets. So, if it were decided that new regional education authorities were necessary, they would need to be accountable to all the councillors of the local authorities concerned. I deliberately didn't want to make any references to any specific situations, nor specifically about Welsh-medium education. A change in statutory procedures needs to work in all situations rather than be a reaction to just one. But having said that, I think what I propose would work very well in situations such as Lansdowne/Treganna. When Carwyn Jones made the decision, he said that it was now up to the local authority to come up with another solution to what even he acknowledged was a crisis that needed to be resolved urgently. However, Cardiff had come up with a whole range of proposals and options. Allowing Cardiff to put forward alternatives along with its preferred option would prevent a "stonewall" decision such as the one Carwyn Jones made. He could not reject "Option A" by hinting, as he did, that another unnamed option might be better but that it was entirely up to the council to second guess what he would find acceptable. Nor would he (or a different minister) then be able to reject a new option presented a few months later after another consultation process on the grounds that yet another unnamed option might be better. That would be both capricious and an abuse of the unequal balance of power between national and local government. Under what I propose, the minister concerned would be put into a situation where s/he had to consider the range of options, and would be left looking very silly if s/he rejected all the options without very good reason. In Kansas we have 308 school districts and the smaller ones are the better run ones! Whilst you have made a large number of interesting points, you appear to have misunderstood one of the fundamental aspects of the current statutory process. The two month period which follows the publication of statutory notices, and which WAG are now proposing to reduce to one month, is not a consultation period at all. It is simply the period during which time people can object to the proposal. There is, also, a statutory requirement for consultation to be conducted, but this must take place before the publication of notices i.e before the proposals are considered fully formed. WAG does not stipulate how long this period should be - but generally one month is accepted as the minimum. During this time local authorities can consult on several options or on one specific option. However, contrary to your envisaged scenario, what they cannot do is consult on one proposal and then publish something which is substantially different. To do so would render the consultation inadequate and would very likely result in a rejection by WAG - or more correctly the Welsh Ministers. Instead, the local authority would be expected to undertake a new round of consultation on its new proposal. I was amused at your suggestion that local authorities should have no difficulty in meeting the proposed two week turnaround for the submission of objections together (and this is the crucial bit) with their responses to those objections. Simply reading hundreds, or in some cases thousands, of objections takes a long time. I am sure that some authorities will struggle with this deadline. Your suggested alternative system for conducting school organisation makes interesting reading. Although I would disagree with some aspects of it (I think you are setting the objection threshold too high)I understand that WAG are currently reviewing the current system and that many of the changes you suggest are under consideration. Leighton Andrews said as much in a statement to plenary back in May. However, these changes would need to be made through an Assembly Measure and could not be made through changes to the secondary legislation which WAG are currently consulting upon. Quite right, Anon. There were places where I should have said objection rather than consultation. I think I've fixed them all now. Thanks. But I am interested in what you say about Leighton Andrews having plans for other changes to the statutory procedures. For if that was indeed his intention, why on earth has he put this particular, very limited, proposal out for consultation now? He would only have to change things again later, so this would become a complete waste of time and effort. For that reason I think it better to assume that he is only doing this because he isn't interested in a more radical change to the procedures. But if you believe he does have anything worthwhile to say on more substantial changes to the system, please point them out. Let's have more detail than just "a statement in May". It seems to me Leighton Andrews is more interested in simply putting a greater onus on local authorities without, as I said, imposing any commensurate improvement in response at a national level. As such, it's just political posturing. I do take your point about dealing with the number of responses, but it is more a matter of paperwork than principle. Neither does the process start only after the end of the objection period. They can start the process as soon as the first objection is received. Perhaps a "sliding scale" might be the best solution: if there are fewer than 100 responses, two weeks; if fewer than 500, three weeks; if more, a month as at present. As for the threshold, I wasn't trying to be prescriptive. I'd like to know what you think would be a reasonable threshold. The part of my suggestion that I would want to hold on to is that a future system should encourage endorsements of the proposal as well as objections, and that the matter should not be referred to national government unless the objections outnumbered the endorsements. I think that would give much more balance to the procedure. "'But if you believe he does have anything worthwhile to say on more substantial changes to the system, please point them out. Let's have more detail than just "a statement in May"." LA has already said that he intends to put in place a system where most school organisation proposals are determined at the local level without Ministers getting involved. If you take a look at his statment, it will give you a clearer idea of his general intentions. As for the actual detail, I understand we will have to wait a couple of months for that to emerge - but I think changes will be pretty radical. I would suggest that the currently proposed changes are an attempt at a short term fix - making new primary legislation takes along time a could not possibly now happen this side of the next Assembly election and politicians are always under pressure to come up with quick answers. With regard to the threshold for objections, I don't think I have a firm view on that. However, your suggested threshold would prove unworkable, partly because not all schools have catchment areas, but also because it would massively disadvantage certain schools. For example, a Welsh medium school in Monmouthshire will attract only a small fraction of the pupils in its catchment area. If the local authority decided to propose the closure of that school, it would be wholly unfair to expect the school to suddenly persuade 25% of the catchment area parents (I assume you meant parents) to object. If I have misunderstood what you have suggested please correct me. Here is a link to LA's oral statement. Thanks, Anon. Let me digest it. OK, I've read it, and am relatively encouraged by what Leighton Andrews says. Yet there are one or two ambiguities that stood out. Speaking of only one objection being required he said, "This cannot be a good use of resources where it is apparent that all those with a genuine interest in the proposal are in favour." But it requires a rather sweeping value judgement to say "all" and "genuine". There are very few instances in which none of the objections express a genuine interest. They might sometimes be ill-informed or misguided, but they're still genuine. I wouldn't want to limit valid objections/commendations to just parents either, as you ask. Schools are a matter for the whole community. Many of those who aren't parents now will be in future, or will have concerns about their grandchildren, or just children's education in general. I also welcome the pilot proposals to speed things up in the WG. But I would repeat that it is unfair to put all the emphasis on making local authorities do things faster, when the minister has a full six months ... and even then does not always stick to the timetable. If Leighton Andrews can cavalier through a 50% reduction there, why does he not also halve his own department's timeframe? Dual standards. But he does hint about moving to a system of "calling in", and on reflection I think that might be the best way forward. Trying to establish a threshold to put in law is problematic (your point about WM in Monmouthshire is well made) and therefore it might be better to give the minister concerned power to call in a proposal at their discretion ... although I'd fully expect the minister to issue guidance as to the specific circumstances in which s/he would be likely do so. Although I don't know too much about Scotland, it is evident that they operate a calling in system ... at least from this story I read yesterday. But I am still left wondering what is the point of a minor alteration to objection and response periods—which are very likely to have virtually no practical impact on any decision, because most are made in good time—if he is actively planning a more radical reform. It's clear what he wants to do. He probably has very clear legislative precedents in England and Scotland that can act as templates for a new Measure. So why do this now, especially if we are to expect firmer proposals in only a few months? If, as you seem to be saying, it's because politicians are keen to be seen to be constantly "doing something" it's a sad indictment of their ability to present and explain the bigger picture ... or of the media, for not asking them to ... or of us, for not wanting to listen. MH - sadly, it is a combination of all three. Politcians are often afraid that the 'big picture' argument will be misunderstood or misrepresnted; from their position, it is far better to go for that which is quick and easy, even though it may be ineffective. The media are generally only interested in big headline/ small picture stories. This is particularly true in Wales - hence the ridiculous level of interest shown in the Ysgol Capel Iwan non-story. As for the general public - well let's just say that 99% of people who started reading this thread will have switched off half way through the first comment!